Jackie Young had a triple-double and Arike Ogunbowale scored 28 points as No. 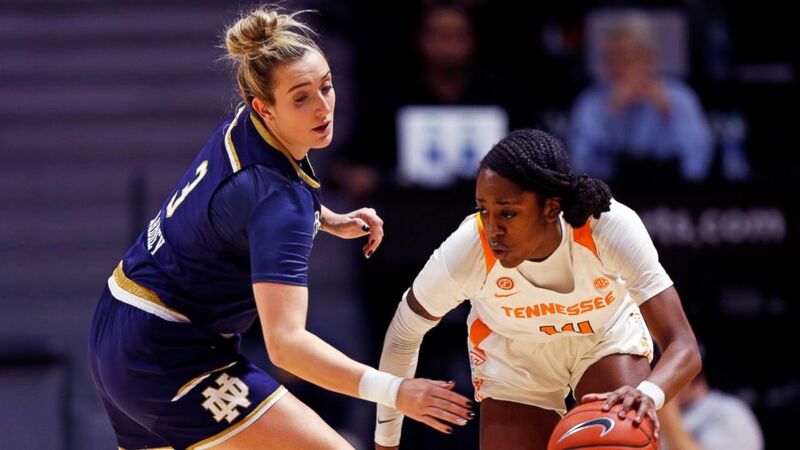 1 Notre Dame rallied in the second half to beat Tennessee 77-62 on Thursday night and continue the Lady Vols’ longest losing streak in nearly half a century. Young had 16 points, 12 rebounds, 10 assists and only two turnovers for the seventh triple-double in Notre Dame history. The school’s last player to post a triple-double was Lindsay Allen against Chattanooga on Dec. 27, 2016. Ogunbowale scored 24 of her 28 points in the second half to help Notre Dame (18-1) earn its 12th consecutive victory. Tennessee (12-7) lost for the sixth consecutive time. The Lady Vols also lost six straight in 1970. Notre Dame trailed 38-32 early in the third quarter before Ogunbowale scored seven points in an 11-0 run. Tennessee rallied to tie it at 44, but Ogunbowale scored 11 more points in a 19-2 spurt by Notre Dame that extended its lead to 63-46 with 6½ minutes remaining. The Irish scored 13 straight points during that 19-2 stretch. Tennessee’s Zaay Green scored a career-high 19 points to go along with eight rebounds and five assists. Evina Westbrook scored 16. Jessica Shepard and Brianna Turner each scored 13 points for Notre Dame. Shepard also had 11 rebounds. Tennessee was playing without starting guard Meme Jackson, who hurt her ankle Monday in a 80-79 loss to Arkansas. Notre Dame beat Tennessee for the eighth time in the last nine attempts. Tennessee owned a 20-0 record against the Irish before this stretch. This game was part of the We Back Pat Week initiative to raise awareness of Alzheimer’s disease in honor of former Tennessee coach Pat Summitt, who died in June 2016 at the age of 64. Both Tennessee and Notre Dame wore We Back Pat T-shirts during pregame warmups. A check for a $500,000 annual grant to the University of Tennessee Medical Center’s Pat Summitt Clinic was presented at the end of the first quarter. The clinic is dedicated to the fight against Alzheimer’s. Notre Dame: The Irish missed 11 of their first 12 shots and trailed for most of the first half before dominating the rest of the way. Notre Dame won despite shooting just 18 of 28 from the foul line and 3 of 12 from 3-point range. Tennessee: Green’s breakthrough performance offers the Lady Vols at least some cause for encouragement, but she cooled off considerably in the second half. She had 15 points, five rebounds and four assists in the first half alone. Notre Dame: at North Carolina on Sunday. Tennessee: hosts LSU on Sunday.